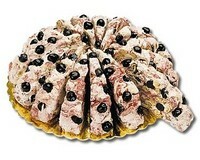 Sold by the slice (around 150g/slice). 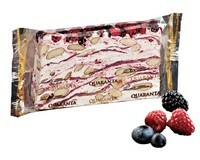 This is a top quality soft nougat made by Quaranta in northern Italy since 1924. 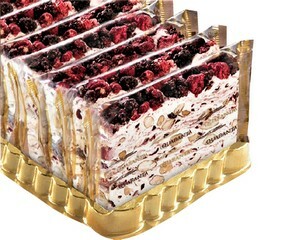 Made with high quality nuts, egg white, honey, sugar and toppped with country berries. 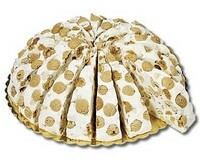 A pure delight for nougat lovers who enjoy a lovely very soft texture combined with wonderful flavour. This product is always popular! Ingredients: Sugar, almonds and hazelnuts in variable proportions, country berries cream 14% (sugar, sunflower oil, country berries 8% blueberries, blackberries, strawberries) cocoa butter, skimed milk powder, whey powder (Milk), acidity regulator: citric acid, vegetable and plant concentrates (carrot, hibiscus), emulsifier: sunflower lecithin, natural flavouring, concentrated lemon juice, gelling agent: pectin. 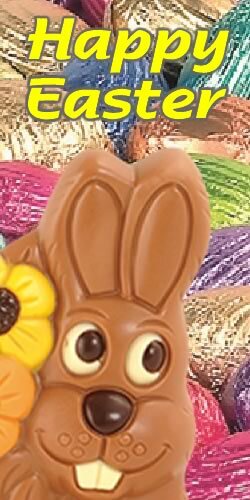 glucose syrup, honey, corn starch, sweetened dried cranberries 5% (cranberries 55%, sugar, sunflower oil) freeze dried blackberries and raspberries in variable proportion 2%, Egg albumen, wafers (potato starch, water), flavourings.